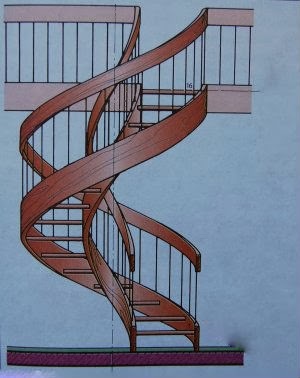 Spiral staircases - an alternative to the most popular kind of stairs . They are ideal in those cases where it is a vertical lift in the limited space. Going up the spiral staircase, a person rotates in space more than 360 degrees. Most often, spiral staircases at home to give the main load, and are complementary or decorative. They can be made in different styles, so you can use them in any interior. Spiral staircases look very effectively through the use of a wide variety of finishing materials and unusual shapes stair railings made of laminated glass, architectural glass and poly carbonate. Use of these materials allows you to create totally exclusive samples of spiral staircases. 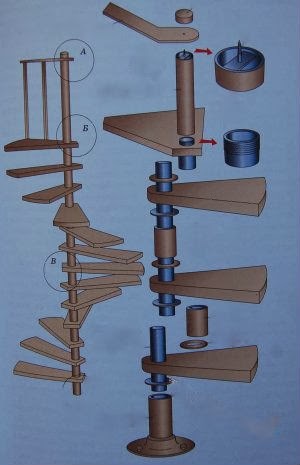 The most frequently used material for the manufacture of spiral stairs are wood, metal or a combination thereof. 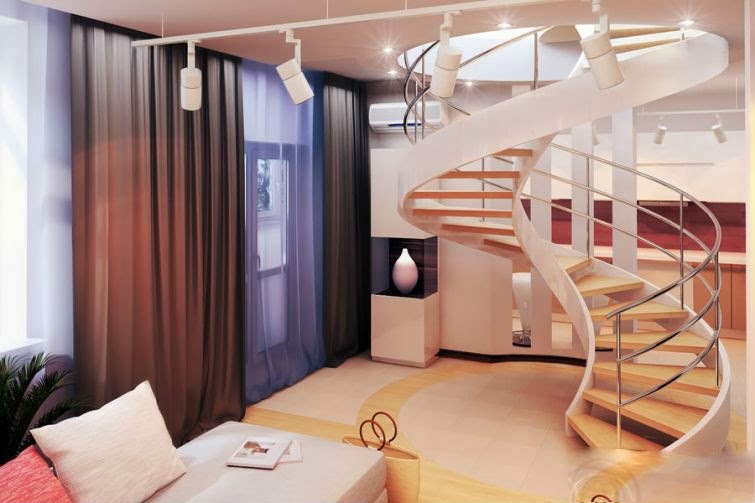 And wooden spiral staircases, metal spiral stairs and look equally good, and the choice of material depends only on the interior where they will be installed. spiral staircase with a central support post. In most cases, this metal pillar in which a narrow stage portion is inserted from the opposite edge they are secured together using Boltzmann. Such spiral staircases do not require additional supporting pillars and can be installed away from the load-bearing walls. They are fixed between the floor and the floor of the initial overlap top. Stage of such ladders are usually made ​​of wood, but you can use a metal or glass. Central Post usually sheathed wooden tabs (cartridges), which serve not only design elements, but also constructive step spiral staircase attached to each other in the narrow part. Protections of such ladders are usually made ​​of stainless steel, and the rail is made ​​curved wooden or PVC. second kind of spiral staircases differs from the first in that the steps are not fixed by Boltzmann. For this purpose, use a bent string . This kind of spiral staircases is a classic, it is much more difficult to manufacture and, consequently, more expensive.